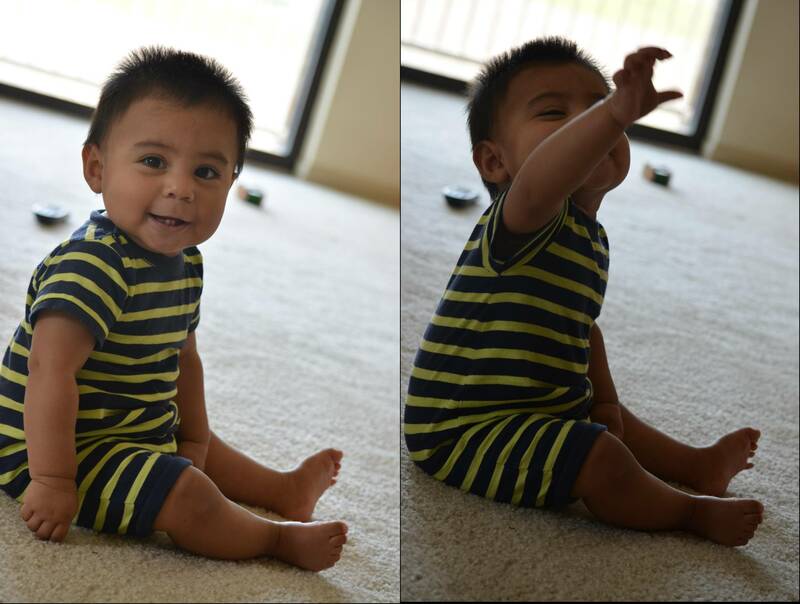 When babies learn to crawl, they stop and sit so their hands are free to play with a toy. One common pattern of sitting that emerges in infancy is the W-sit. The name of this position comes from the idea that if you take a photo from above, the shape of the legs looks like the letter “W.” Look at the top photo of baby Sayid in the W-sit position. His hands are free to play with toys while he sits. However, Sayid’s mother knew that the W-sit position was not the best for him, so she requested a virtual lesson with Stellar Caterpillar. After one virtual lesson and some daily guidance from his mother, Sayid learned to prefer other sitting positions such as the long sitting position which is seen in the bottom photo where he sits with his legs extended out in front of him. Let’s explore why other sitting positions are preferable for the motor skill development of a baby. When crawling or walking, babies often just plop down into the W-sit. It is a quick movement and requires less coordination of the bones and muscles, so it is easier to do than the side sit, butterfly sit, or long sit. Sitting in this position very quickly accomplishes their goal of sitting down and freeing their arms and hands to play with toys or eat a snack. Quite simply, babies W-sit because they get what they want quickly! As they learn other patterns of sitting, baby’s body recognizes the benefits and begins to prefer the other, and developmentally beneficial, sitting positions. These include tailor sit, butterfly sit, Z-sit, and long sit. Slowly they drop the pattern of W-sit. WHAT IS THE PROBLEM WITH THE W-SIT? Babies are limited in their mobility as they W-sit. Their lower legs and pelvis are fixed in a way that is not easily moveable and they are not able to shift their weight from side to side or twist/rotate their torso. They play with toys on their right side with their right hand and toys on their left side with their left hand. This does not develop the skill of mid-line crossing (reaching across the body) and does not encourage the development of hand dominance (preferring the use of right hand or left hand). The internal rotation of the hips tightens the hips muscles and actually makes it more difficult to sit in the other positions as time goes on. This leads to the W-sit becoming a habit. Over time if the child continues to W-sit as she grows it may lead to orthopedic problems such as hip dislocation or knee pain. HOW CAN A PARENT PREVENT BABY FROM W-SITTING? The key to avoiding the W-sit is to guide baby to learn other choices for sitting. Baby will feel the advantages in these other positions and choose them over the W-sit. Some babies will learn the other sitting positions right away, the first time you show them. Other babies will require much repetition until they finally find them on their own. And a few babies will need even more repetition to find the position. What is important to remember is that baby will learn to choose other ways of sitting and will enjoy them very much as they discover improved mobility. They can grab toys all around them in these other positions due to the ability to rotate their torso and reach across their mid-line. Observe baby Sayid in the above photos. In the top photo (in the view taken from above his head), he is in the W-sit and can turn only his head to the side. His torso is fixed in position. In the bottom photo of Sayid in the long sitting position, he is able to turn his torso toward the camera to smile and to reach toward his mother. The more he sits in this new position, the more he will discover he can turn his torso and reach to the side. His movement will develop with more skill. By teaching baby alternate ways of sitting that offer her more mobility, baby will develop motor skills with more strength, balance, and coordination. This will enhance more advanced motor skill development such as walking, running, climbing, dancing, and more. Babies prepare their bones and muscles for the motor skill of crawling through achieving mini milestones. One of these is the activity of scooting around in circles with the belly on the floor. How does this prepare the body for crawling on the hands and knees or on the belly? If baby is pushing with her hands to move in a circle she is developing the use of a flat palm which is necessary to support her weight on her hands and knees. The action of pushing with her palm teaches the shoulder muscles to work. She also learns that by pushing part of her body against the floor she moves around on the floor. This is the beginning of learning skills of locomotion. When she looks over one shoulder and scoots in that direction she is also developing the movement of the ribcage. One of the most important developments that occurs when baby is scooting in a circle is the movement between the ribcage and the pelvis. Observe the baby in the above video from joshandkarale’s youtube channel. Look at the wrinkles that develop in the baby’s shirt on the sides of his ribcage. If he looks to the right and scoots to the right you will see the wrinkles that appear on the right side of his T-shirt. This happens because the right side of the ribcage is moving closer to the right hip joint. The baby is slightly closing the right side of her body. When the baby learns to crawl on her belly or on her hands and knees you may see this distance (between the ribs and pelvis) alternating between opening and closing. A baby that is very articulate in this movement often crawls very fast. The motor skill of sitting up may also be more graceful in a baby that can articulate this relationship between the ribcage and the pelvis. Allow baby to spend time scooting in circles on the floor. Try inviting this movement by placing toys a bit off to the right or left since the movement begins with baby looking over one shoulder. When does baby learn to crawl? Maybe after scooting in circles! Baby learns to do a push up on the stairs. This strengthens her arms for hands and knees crawling. Babies gain strength in their muscles through learning motor skills. This means that they do not need to do repetitive exercises as we do them in a gym. The actions of learning each motor skill develops much strength. Kicking, for example, is one of the first motor skills that baby learns and it develops quite a bit of strength in the muscles of the legs. The action of lifting the legs and moving them (kicking) on her own requires strength. As baby grows and gains weight her limbs become bigger and heavier. This in turn builds even more strength. No need to put more weights on the machine at the gym, baby’s changes in her body size increase the challenge for her muscles. In tummy-time, the action of lifting the head strengthens her head and neck muscles. Baby’s head is one of the heaviest parts of her body, so through practice of this motor skill her back and neck muscles become very strong and prepare her for sitting with excellent baby posture. As baby learns to move her own body weight around she gains a tremendous amount of strength. Baby’s shoulders, hands, and arms needs to develop strength for the motor skill of crawling in the hands and knees position. This strength develops from the mini-milestone of pushing. Adults build arm, hand, and shoulder strength from push-ups. Babies do a version of a push up when they push their hands into the floor in tummy time or when they learn to push the hand down on a stair. The seven month old baby in the above photo is strengthening her arms as she pushes down into the stairs while learning the skill of climbing. When a baby learns to lift her pelvis and pull her knees under her, yet remains with her forearms on the floor, her back will “cave in” or have a large arch to it. Once she strengthens the muscles of her arms and shoulders she can push down into the floor and get into the hands and knees crawling position. Now her back is arched less. This crawling position will build even more strength for baby as she supports all of her weight on only her hands and knees. She may need to pull up to this position and not move for a while. She has to develop strength in this position before she can move. Over the next several weeks, hands and knees crawling develops much strength in her arm and legs muscles which prepare her for the motor skill of standing up. 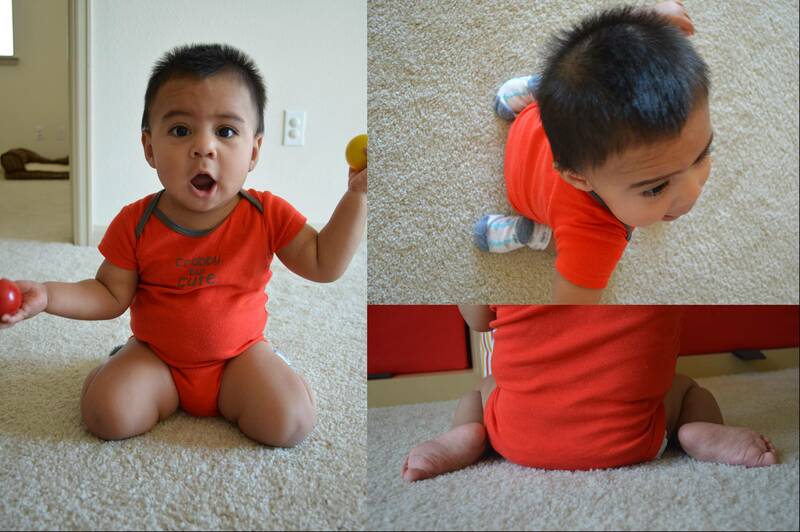 My baby will soon be crawling. We have wood floors, so I am wondering how to make it easy on his knees/toes and how to soften any falls on his face or chin. Do you have any suggestions or should I not worry about it? Thanks. You have a great website! Many mothers ask this question as their precious baby begins to rock back and forth on all fours. The precarious shifts of weight while gaining the strength to crawl forward on the hands and knees may include occasional falls. This is part of the learning process. Many mothers would like the ground to be as soft as possible for those moments where baby begins to crawl and soon falls down. Homes with carpet work just fine as do homes with wood or tile floors. Babies learn to crawl on wood and stone floors all over the world. Just think about the floors in countries with hot climates and where carpeting is not practical such as Mexico, Israel, Italy, and Indonesia. Babies learn all of their motor skills on these hard and often uneven floors. Avoid using baby knee pads which are not great for the development of a baby. If you would like to “soften” the floor a bit, try placing a quilt on the ground or buy some interlocking foam to create a large play mat. It is thick enough to provide some softness yet still firm enough to provide stability. And remember, fortunately the ground is not far away. When baby learns to meet each of his motor milestones, it benefits him when he falls down. Baby will fall out of one movement into another. For example, a baby that walks will fall down and land in the hands and knees crawling position. A baby that is hands and knees crawling will fall down into the belly crawling position. The motor skill of rolling is a pattern that a baby who is walking or crawling may land in after a fall. However, baby will only land in these positons or actions if he has learned them well and repeated them many times. The motor skills that baby has learned become very strong patterns of movement in the brain. These are called movement habits. This means that the body will automatically transition from a quick fall into one of these familiar patterns which include rolling and belly crawling. In the motor milestones of crawling and falling, I suggest that what is most important is not whether or not the floor is too hard, but whether or not baby has mastered the earlier motor skills of rolling and belly crawling. Hello, I just stumbled across your website when looking for things that may help my 8 month old’s posture. He’s a big boy (about 25 1/2 lbs) and very long, and I am concerned that because of this it will affect his posture. He does sit up but not as straight as I would like..is there anything I can do to help him improve it? He gets plenty of tummy time each day, but he also has a walker and jumper…Any advice is greatly appreciated! You are a very observant mother. Yes, a larger baby may very well be more challenged with his posture. In general, larger babies may have more difficulty learning motor skills because their body parts weigh more and their limbs are longer to maneuver. Think of it this way, when babies learn the motor skill of lifting the head a baby with a larger head is lifting a heavier weight. Or a larger size baby learning the hands and knees crawling position is supporting much more weight on his limbs than a smaller baby of the same age. To improve his posture, first eliminate the walker and jumper. By “walker” I assume you mean an “exersaucer.” Please read my posts on “Exersaucer Dangers” and “The Jumper.” By forcing the baby to be in an upright posture his muscles fatigue and tighten up, which pulls his out of a good posture. This pulls him into a forward curved posture. Tummy-time is the best place for him at this age. He will learn to crawl by being on the floor where his hands and knees are able to discover that when they push against the floor they move him a bit. This is the beginning of crawling and is exactly how a baby learns to crawl. He will also enjoy tummy-time more if you get down on the floor with him and look at him eye-to-eye. He should be able to play on the floor for long periods of time in tummy time. Then he will have perfect posture because the back and neck muscles have become very strong from lifting his head. Have a variety of developmental toys for him to keep his interest while he is in tummy-time. Rattles with different sounds and textures are ideal. Remember that babies love the new and unusual so a collection of toys that feel different from one another and make a variety of sounds will stimulate your son. The benefits of motor skill play for larger babies is the gracefulness they gain in their nervous system for managing their bodies as they grow through childhood and into adulthood.